Is shopping with B2C Jewels secure? At B2C Jewels, complete security for customer transactions is our primary concern. All information provided by you is securely transmitted to us using Verisign SSL security, the standard method accepted industry wide for your payment gateway. As for your purchase from us we are very confident that you will be extremely pleased with your jewelry. Incase of any doubt about the product you receive, we offer a 30-Day money back guarantee. Do you provide gemological certificates for your products? Yes we do provide gemological certificates but not for all products. The only products that do come with certificates are the loose diamonds. The lab that issues the gemological certificate will be detailed when you are placing your order. 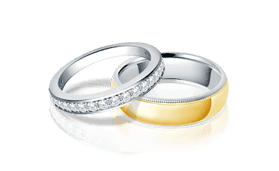 What is the importance of a GIA certificate? A GIA diamond certificate assures all customers of a diamond’s value and quality. The report gives a detailed enlisting of the key characteristics of each diamond which includes the 4C's and makes it almost impossible to falsify. The GIA certificate marks the credibility of the stone under consideration. What do I look for in the quality of a diamond? While making a diamond purchase, you need to keep in mind the 4C’s- cut, color, clarity and carat- which are the key characteristics in a diamond. Generally the best quality diamonds are those with maximum brilliance which is determined by the cut of the diamond and no tinge of yellow in case of the regular colorless diamonds. The carat, that is the weight of the diamond, is most often a matter of personal tastes. For more information about the 4C’s you can visit our education section which is designed to encourage people to make an informed purchase. Is there a Grading system for pearls? No, there is no a standard grading system for pearls. Because no two pearls are ever alike, such a grading system would require many quality specifications. Also some pearls are so distinguishing that they completely defy comparison. 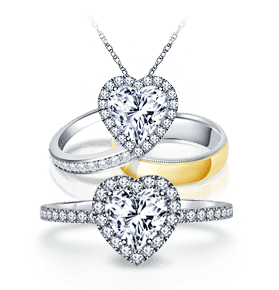 What is your stance against purchasing Conflict Diamonds? B2C Jewels is dedicated to providing high quality diamonds to our customers for the best possible and ethical values. We too share the public's concern regarding conflict diamonds. Here at B2C Jewels we purchase our diamonds only through respected, legitimate channels. B2C Jewels will continue to be a proud supporter of the Kimberley Process that works to uphold legitimacy in the diamond trade and stops the trade of conflict diamonds. Our aim is to achieve absolute customer satisfaction by providing the highest quality. With our on-staff gemologist and quality assurance department, you can rest assured that you are getting only the highest quality, best product. How do I know that the item I purchase is the one that I will receive? Your purchase will arrive with an original GIA certificate for loose diamonds. You can either have your purchase appraised by a local jeweler or inspected for your piece of mind. If you are not satisfied with the appraisal of your purchase, you can return the item within 30 days of delivery date with the original certificate. Purchases including a loose diamond for $50,000 or above may be returned within 10 days of delivery date. Special orders, such as custom mountings or jewelry pieces that were requested but not shown on the website, are non-refundable. Because we buy direct from diamond wholesalers, and do not have a brick and mortar store we can offer you such low prices. If we save, you save. Every jewelry facet that we offer is presented to you at a discounted price. You can find your ring size by following the directions given on our education section which comprise of few easy steps.Click here to get your ring size. Yes, we will gladly re-size a ring purchased from us that proves to be too small or too large for up to 30 days from purchase, FREE of charge. You will be responsible for shipping charges when sending an item to us for re-sizing. 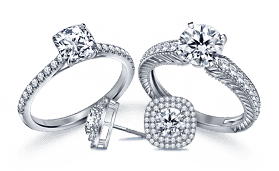 Re-sizing is offered one-time per purchase and can only be done up to 1 size above or 1 size below the size of the original ring. Please review our warranty page for more details. Can I place an order if I stay outside US? Yes - we ship to internationally to most countries via insured international priority FedEx or UPS. Depending on the item purchased the arrival of the product may be anytime between 2-10 days. Is shipping free on all your orders? Shipping is absolutely free on all domestic orders. There is a small fee if you would like to upgrade your shipping preference. Yes. We are very proud of our armed forces and will be glad to make their time aboard as comfortable and easy as much at home. Yes, all our shipments are free from any risks. B2C Jewels uses UPS or USPS to ship the products. All the products are insured and require a signature at the time of delivery to you. b2cjewels.com accepts all major cards and wire transfer as well. A change or cancellation of order, under normal circumstances, is, by no means, a problem. You just need to contact us and we will do the best that can be accommodated. Refunds can be expected within 5-7 days from the day we receive and inspect the item that has been returned.